Effective corporate branding is one of the most essential steps your business can take towards establishing a consistent and successful communication strategy. Your corporate identity (logo, letterhead, envelope and business cards), and by extension, corporate branding (collateral pieces and advertising), are all a reflection of you and your company. Properly designed, they communicate to your customers that your company is credible, trustworthy and professional. Hence, your identity and effective corporate branding stands as the cornerstone of your business. It differentiates you from your competitors and creates a lasting impression in the minds of your customers. The Webphotographix design team can help you to create a powerful business image where in just a few seconds, everything your business stands for is perfectly communicated to your target audience. Because we value your business and want to see you succeed, we offer small and mid-size businesses the same quality workmanship and design, usually only available to larger businesses, at just as fraction of the cost. If you want to be successful, you simply cannot afford to have poorly designed work, inconsistent, little or no identity and unclearly communicated branding. Review our Corporate Branding and Identity Design services below, and let Webphotographix help you better position your organization by creating stronger brand awareness and recognition. Corporate ID Package (Logo, Business Card, Letterhead, Envelope), Tri-fold Brochure, Invoice, up to three (3) Business/Employment Forms or Oversized Post-Card/ Direct Mail or similar Promotional piece, 3 page PowerPoint template), only $1800. Showcase your company in STYLE! A polished, professionally-designed brochure can go along way towards an effective marketing campaignand so, we want to help you. 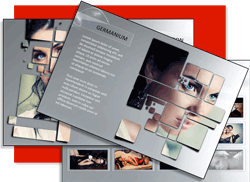 Webphotographix creates high-quality, professional brochures for your business! We visually communicate your company's message with style, clarity and confidence. Visit our design portfolio to see samples of our brochure design, and the many small businesses and corporations we have helped to brand their business. Get in touch to find out how Webphotographix's brochure design, can sell the best you! Webphotographix offers several design packages for your brochure. Prices are based on the complexity of the design required. The list below outlines what is included in each package. As a bonus, we provide professional photos from our ‘already existing’ stock photo library at no extra charge. However, if there are specific photos you would like to be used in your project, you are free to provide them, or we can locate them for you at an additional charge. If you require more (or less) of something than what you see here, we can customize a solution just for you. View our Brochure Design Portfolio. 1 page (2 sides); Cut Size 10.98" x 8.50"; custom design cover and pages; 1 design concept; 2 revisions and 2–6 stock photos. Impress your audience, and keep them awake with a dynamic, custom designed PowerPoint presentation! Webphotographix transforms PowerPoint presentations from boring to brilliant! We tailor-make presentations that not only show professionalism and tell your story, but, they captivate your audience and help you win new business! Step out from the competition and make a statement with an effective, eye-catching, custom-designed PowerPoint presentation. Contact Webphotographix today, and find out how we can help you impress your audience with a well-designed, professional PowerPoint presentation. The possibilities of print, promotional design are endless! Print design has always served as an effective marketing tool. But now, it has the added benefit of driving customers and traffic to your website. There, in a no-hassle environment, potential customers can find out more about you, your business and the products/services you offer. Contact Webphotographix, and showcase your business today! We would love to work on one of your projects, and working with Webphotographix, you can relax knowing that every aspect of your print, promotional campaign, from concept to delivery, will be handled by design professionals. If it can be designed, we can design it! If we don't know how, we'll find out, or find someone that can get the job done! Below is a list and pricing for some of the items we design, that you may order separately from the design-packages we have presented above. These print, promotional items include: billboards, banners, truck wraps, outdoor signs, product labels, table-tents, tattoos, magnets, t-shirts, product packaging, flyers, posters, point of purchase displays, invitations, menus, greeting cards, postcards, and other promotional items. or color outside, black & white inside. ADDITIONAL/COMPANION DESIGN SERVICE PRICING:Because sometimes, you just need a little more time.